To meet the reliability and scaling needs, Amazon has developed a number of storage technologies, of which the Amazon Simple Storage Service (also available outside of Amazon and known as Amazon S3), is probably the best known. This paper presents the design and implementation of Dynamo, another highly available and scalable distributed data store built for Amazon’s platform. Dynamo is used to manage the state of services that have very high reliability requirements and need tight control over the tradeoffs between availability, consistency, cost-effectiveness and performance. 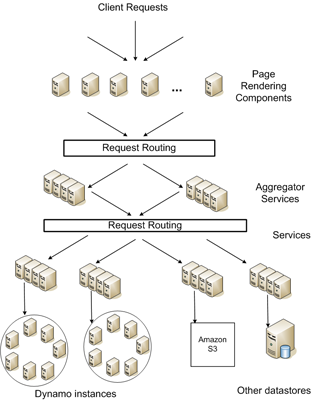 Amazon’s platform has a very diverse set of applications with different storage requirements. A select set of applications requires a storage technology that is flexible enough to let application designers configure their data store appropriately based on these tradeoffs to achieve high availability and guaranteed performance in the most cost effective manner. There are several peer-to-peer (P2P) systems that have looked at the problem of data storage and distribution. The first generation of P2P systems, such as Freenet and Gnutella, were predominantly used as file sharing systems. These were examples of unstructured P2P networks where the overlay links between peers were established arbitrarily. In these networks, a search query is usually flooded through the network to find as many peers as possible that share the data. P2P systems evolved to the next generation into what is widely known as structured P2P networks. These networks employ a globally consistent protocol to ensure that any node can efficiently route a search query to some peer that has the desired data. Systems like Pastry  and Chord  use routing mechanisms to ensure that queries can be answered within a bounded number of hops. To reduce the additional latency introduced by multi-hop routing, some P2P systems (e.g., ) employ O(1) routing where each peer maintains enough routing information locally so that it can route requests (to access a data item) to the appropriate peer within a constant number of hops. Among these systems, Bayou, Coda and Ficus allow disconnected operations and are resilient to issues such as network partitions and outages. These systems differ on their conflict resolution procedures. For instance, Coda and Ficus perform system level conflict resolution and Bayou allows application level resolution. All of them, however, guarantee eventual consistency. Similar to these systems, Dynamo allows read and write operations to continue even during network partitions and resolves updated conflicts using different conflict resolution mechanisms. Distributed block storage systems like FAB  split large size objects into smaller blocks and stores each block in a highly available manner. In comparison to these systems, a key-value store is more suitable in this case because: (a) it is intended to store relatively small objects (size < 1M) and (b) key-value stores are easier to configure on a per-application basis. Antiquity is a wide-area distributed storage system designed to handle multiple server failures . It uses a secure log to preserve data integrity, replicates each log on multiple servers for durability, and uses Byzantine fault tolerance protocols to ensure data consistency. In contrast to Antiquity, Dynamo does not focus on the problem of data integrity and security and is built for a trusted environment. Bigtable is a distributed storage system for managing structured data. It maintains a sparse, multi-dimensional sorted map and allows applications to access their data using multiple attributes . Compared to Bigtable, Dynamo targets applications that require only key/value access with primary focus on high availability where updates are not rejected even in the wake of network partitions or server failures. To illustrate the use of vector clocks, let us consider the example shown in Figure 3. A client writes a new object. The node (say Sx) that handles the write for this key increases its sequence number and uses it to create the data's vector clock. The system now has the object D1 and its associated clock [(Sx, 1)]. The client updates the object. Assume the same node handles this request as well. 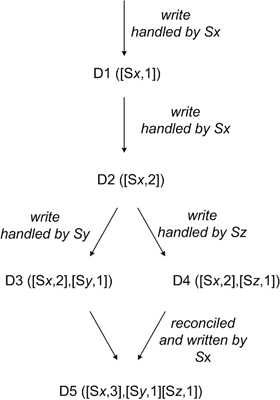 The system now also has object D2 and its associated clock [(Sx, 2)]. D2 descends from D1 and therefore over-writes D1, however there may be replicas of D1 lingering at nodes that have not yet seen D2. Let us assume that the same client updates the object again and a different server (say Sy) handles the request. The system now has data D3 and its associated clock [(Sx, 2), (Sy, 1)]. Now assume some client reads both D3 and D4 (the context will reflect that both values were found by the read). 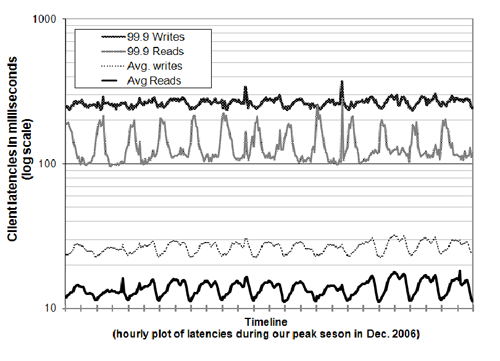 The read's context is a summary of the clocks of D3 and D4, namely [(Sx, 2), (Sy, 1), (Sz, 1)]. If the client performs the reconciliation and node Sx coordinates the write, Sx will update its sequence number in the clock. The new data D5 will have the following clock: [(Sx, 3), (Sy, 1), (Sz, 1)]. In Amazon’s environment node outages (due to failures and maintenance tasks) are often transient but may last for extended intervals. A node outage rarely signifies a permanent departure and therefore should not result in rebalancing of the partition assignment or repair of the unreachable replicas. Similarly, manual error could result in the unintentional startup of new Dynamo nodes. For these reasons, it was deemed appropriate to use an explicit mechanism to initiate the addition and removal of nodes from a Dynamo ring. An administrator uses a command line tool or a browser to connect to a Dynamo node and issue a membership change to join a node to a ring or remove a node from a ring. The node that serves the request writes the membership change and its time of issue to persistent store. The membership changes form a history because nodes can be removed and added back multiple times. A gossip-based protocol propagates membership changes and maintains an eventually consistent view of membership. Each node contacts a peer chosen at random every second and the two nodes efficiently reconcile their persisted membership change histories. Failure detection in Dynamo is used to avoid attempts to communicate with unreachable peers during get() and put() operations and when transferring partitions and hinted replicas. For the purpose of avoiding failed attempts at communication, a purely local notion of failure detection is entirely sufficient: node A may consider node B failed if node B does not respond to node A’s messages (even if B is responsive to node C's messages). 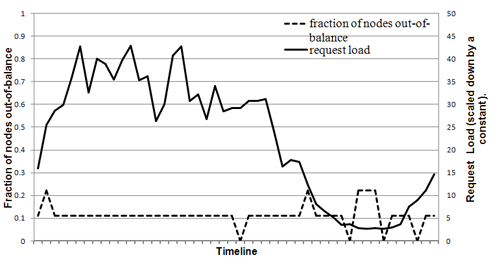 In the presence of a steady rate of client requests generating inter-node communication in the Dynamo ring, a node A quickly discovers that a node B is unresponsive when B fails to respond to a message; Node A then uses alternate nodes to service requests that map to B's partitions; A periodically retries B to check for the latter's recovery. In the absence of client requests to drive traffic between two nodes, neither node really needs to know whether the other is reachable and responsive. Strategy 1: T random tokens per node and partition by token value: This was the initial strategy deployed in production (and described in Section 4.2). In this scheme, each node is assigned T tokens (chosen uniformly at random from the hash space). The tokens of all nodes are ordered according to their values in the hash space. Every two consecutive tokens define a range. The last token and the first token form a range that "wraps" around from the highest value to the lowest value in the hash space. Because the tokens are chosen randomly, the ranges vary in size. 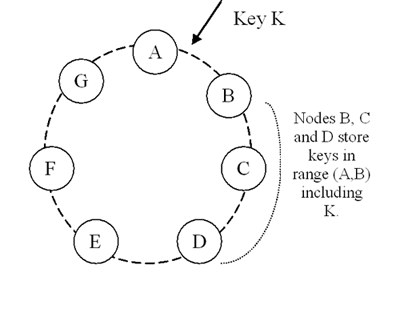 As nodes join and leave the system, the token set changes and consequently the ranges change. Note that the space needed to maintain the membership at each node increases linearly with the number of nodes in the system. Strategy 3: Q/S tokens per node, equal-sized partitions: Similar to strategy 2, this strategy divides the hash space into Q equally sized partitions and the placement of partition is decoupled from the partitioning scheme. Moreover, each node is assigned Q/S tokens where S is the number of nodes in the system. When a node leaves the system, its tokens are randomly distributed to the remaining nodes such that these properties are preserved. Similarly, when a node joins the system it "steals" tokens from nodes in the system in a way that preserves these properties. The admission controller constantly monitors the behavior of resource accesses while executing a "foreground" put/get operation. Monitored aspects include latencies for disk operations, failed database accesses due to lock-contention and transaction timeouts, and request queue wait times. This information is used to check whether the percentiles of latencies (or failures) in a given trailing time window are close to a desired threshold. For example, the background controller checks to see how close the 99th percentile database read latency (over the last 60 seconds) is to a preset threshold (say 50ms). The controller uses such comparisons to assess the resource availability for the foreground operations. Subsequently, it decides on how many time slices will be available to background tasks, thereby using the feedback loop to limit the intrusiveness of the background activities. Note that a similar problem of managing background tasks has been studied in . The authors would like to thank Pat Helland for his contribution to the initial design of Dynamo. We would also like to thank Marvin Theimer and Robert van Renesse for their comments. Finally, we would like to thank our shepherd, Jeff Mogul, for his detailed comments and inputs while preparing the camera ready version that vastly improved the quality of the paper. Adya, A., Bolosky, W. J., Castro, M., Cermak, G., Chaiken, R., Douceur, J. R., Howell, J., Lorch, J. R., Theimer, M., and Wattenhofer, R. P. 2002. Farsite: federated, available, and reliable storage for an incompletely trusted environment. SIGOPS Oper. Syst. Rev. 36, SI (Dec. 2002), 1-14. Chang, F., Dean, J., Ghemawat, S., Hsieh, W. C., Wallach, D. A., Burrows, M., Chandra, T., Fikes, A., and Gruber, R. E. 2006. Bigtable: a distributed storage system for structured data. In Proceedings of the 7th Conference on USENIX Symposium on Operating Systems Design and Implementation - Volume 7 (Seattle, WA, November 06 - 08, 2006). USENIX Association, Berkeley, CA, 15-15. Douceur, J. R. and Bolosky, W. J. 2000. Process-based regulation of low-importance processes. SIGOPS Oper. Syst. Rev. 34, 2 (Apr. 2000), 26-27. Fox, A., Gribble, S. D., Chawathe, Y., Brewer, E. A., and Gauthier, P. 1997. Cluster-based scalable network services. In Proceedings of the Sixteenth ACM Symposium on Operating Systems Principles (Saint Malo, France, October 05 - 08, 1997). W. M. Waite, Ed. SOSP '97. ACM Press, New York, NY, 78-91. Ghemawat, S., Gobioff, H., and Leung, S. 2003. The Google file system. In Proceedings of the Nineteenth ACM Symposium on Operating Systems Principles (Bolton Landing, NY, USA, October 19 - 22, 2003). SOSP '03. ACM Press, New York, NY, 29-43. Gray, J., Helland, P., O'Neil, P., and Shasha, D. 1996. The dangers of replication and a solution. In Proceedings of the 1996 ACM SIGMOD international Conference on Management of Data (Montreal, Quebec, Canada, June 04 - 06, 1996). J. Widom, Ed. SIGMOD '96. ACM Press, New York, NY, 173-182. Gupta, I., Chandra, T. D., and Goldszmidt, G. S. 2001. On scalable and efficient distributed failure detectors. In Proceedings of the Twentieth Annual ACM Symposium on Principles of Distributed Computing (Newport, Rhode Island, United States). PODC '01. ACM Press, New York, NY, 170-179. Kubiatowicz, J., Bindel, D., Chen, Y., Czerwinski, S., Eaton, P., Geels, D., Gummadi, R., Rhea, S., Weatherspoon, H., Wells, C., and Zhao, B. 2000. OceanStore: an architecture for global-scale persistent storage. SIGARCH Comput. Archit. News 28, 5 (Dec. 2000), 190-201. Karger, D., Lehman, E., Leighton, T., Panigrahy, R., Levine, M., and Lewin, D. 1997. Consistent hashing and random trees: distributed caching protocols for relieving hot spots on the World Wide Web. In Proceedings of the Twenty-Ninth Annual ACM Symposium on theory of Computing (El Paso, Texas, United States, May 04 - 06, 1997). STOC '97. ACM Press, New York, NY, 654-663. Merkle, R. A digital signature based on a conventional encryption function. Proceedings of CRYPTO, pages 369–378. Springer-Verlag, 1988. Ramasubramanian, V., and Sirer, E. G. Beehive: O(1)lookup performance for power-law query distributions in peer-to-peer overlays. In Proceedings of the 1st Conference on Symposium on Networked Systems Design and Implementation, San Francisco, CA, March 29 - 31, 2004. Reiher, P., Heidemann, J., Ratner, D., Skinner, G., and Popek, G. 1994. Resolving file conflicts in the Ficus file system. In Proceedings of the USENIX Summer 1994 Technical Conference on USENIX Summer 1994 Technical Conference - Volume 1 (Boston, Massachusetts, June 06 - 10, 1994). USENIX Association, Berkeley, CA, 12-12..
 Rowstron, A., and Druschel, P. Pastry: Scalable, decentralized object location and routing for large-scale peer-to-peer systems.Proceedings of Middleware, pages 329-350, November, 2001. 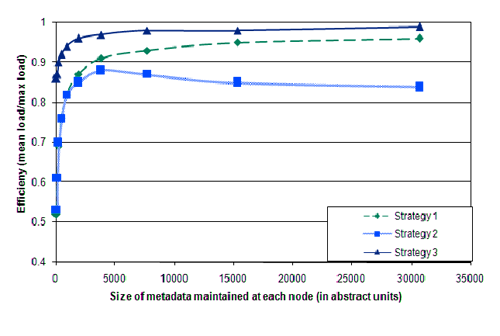 Rowstron, A., and Druschel, P. Storage management and caching in PAST, a large-scale, persistent peer-to-peer storage utility. Proceedings of Symposium on Operating Systems Principles, October 2001. Saito, Y., Frølund, S., Veitch, A., Merchant, A., and Spence, S. 2004. FAB: building distributed enterprise disk arrays from commodity components. SIGOPS Oper. Syst. Rev. 38, 5 (Dec. 2004), 48-58. 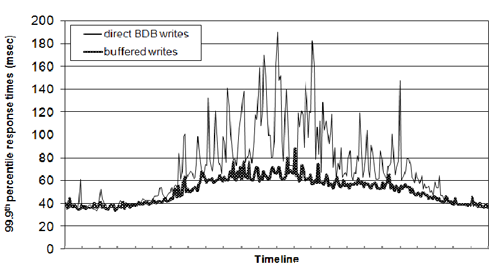 Satyanarayanan, M., Kistler, J.J., Siegel, E.H. Coda: A Resilient Distributed File System. IEEE Workshop on Workstation Operating Systems, Nov. 1987. Stoica, I., Morris, R., Karger, D., Kaashoek, M. F., and Balakrishnan, H. 2001. Chord: A scalable peer-to-peer lookup service for internet applications. In Proceedings of the 2001 Conference on Applications, Technologies, Architectures, and Protocols For Computer Communications (San Diego, California, United States). SIGCOMM '01. ACM Press, New York, NY, 149-160. Terry, D. B., Theimer, M. M., Petersen, K., Demers, A. J., Spreitzer, M. J., and Hauser, C. H. 1995. Managing update conflicts in Bayou, a weakly connected replicated storage system. In Proceedings of the Fifteenth ACM Symposium on Operating Systems Principles (Copper Mountain, Colorado, United States, December 03 - 06, 1995). M. B. Jones, Ed. SOSP '95. ACM Press, New York, NY, 172-182. Thomas, R. H. A majority consensus approach to concurrency control for multiple copy databases. ACM Transactions on Database Systems 4 (2): 180-209, 1979. Weatherspoon, H., Eaton, P., Chun, B., and Kubiatowicz, J. 2007. Antiquity: exploiting a secure log for wide-area distributed storage. SIGOPS Oper. Syst. Rev. 41, 3 (Jun. 2007), 371-384. Welsh, M., Culler, D., and Brewer, E. 2001. SEDA: an architecture for well-conditioned, scalable internet services. In Proceedings of the Eighteenth ACM Symposium on Operating Systems Principles (Banff, Alberta, Canada, October 21 - 24, 2001). SOSP '01. ACM Press, New York, NY, 230-243.